Background: Abnormal thickening of the bronchial subepithelial reticular basement membrane (RBM) is a recognised feature of airway remodelling.1–3 However, even although the RBM is present in the airways of healthy children and adults, nothing is known about its normal development. We hypothesised that the RBM is first visible at birth and subsequently thickens normally with age for the first 3 years, when final adult thickness is reached. Results: The RBM was first visible at 30 weeks gestation (28–34 weeks gestation, median (range) RBM thickness 1.1 μm (0–1.68)), and thickened rapidly during the first 3 years of life (fig). Subsequently it continued to thicken at a slower rate until 17 years (15–17 years old, median RBM thickness 5.78 μm (4.89–6.68)). From 6 years onwards, there was large biological variability in RBM thickness, which may explain why no plateau was seen as expected. RBM thickness was related to both weight and height of subjects (Spearman’s r = 0.729, p<0.001 and r = 0.725, p<0.001) and increased with increasing airway size (Spearman’s r = 0.357, p<0.001). Conclusions: The RBM in healthy humans is first visible using light microscopy at approximately 30 weeks gestation and subsequently thickens with age. The large degree of biological variability in RBM thickness precluded the determination of an age when final adult thickness is reached. The influence of age, body and airway size on RBM thickness suggests that paediatric airway pathology studies should include controls matched for these parameters. Background: Exhaled nitric oxide (FeNO50), sputum analysis and exhaled breath condensate pH (EBC pH) are recognised non-invasive markers of airway inflammation. The asthma control test (ACT) is a validated tool that can be used in clinical practice for monitoring asthma control. Aim: To investigate whether the measurements of non-invasive markers of inflammation (FeNO50, sputum eosinophils and neutrophils and EBC pH) reflect asthma control in children with a range of asthma severity. Methods: Sputum induction and EBC were performed and FeNO50 was measured in 55 children with severe asthma and in 35 children with mild–moderate asthma. The ACT was used to evaluate current symptom control over the previous 4 weeks. Results: FeNO50 was significantly increased in the poorly controlled compared with the well controlled group (p = 0.009) (fig). However, there was a marked overlap between the groups. Sputum eosinophils (p = 0.183), sputum neutrophils (p = 0.518), and EBC pH (p = 0.136) did not differ between the three different control groups. Conclusion: FeNO50 may reflect recent poor control better than sputum cytology and EBC pH. Background: Goblet cell hyperplasia and decreased ciliogenesis are characteristic features of chronic asthma and this may be influenced by exposure to Th2 cytokines (eg, IL-9 and IL-13). IL-13 may cause goblet cell hyperplasia, increased mucus production and decreased ciliogenesis. Aim: We studied in vitro basal mucociliary differentiation and looked for differences (between normal and asthmatic individuals) when paediatric epithelial cells were exposed to IL-13, IL-9 and IL-9 plus IL-13. Method: Blind non-bronchoscopic bronchial brushings obtained from children (normal and asthmatic) are differentiated at the air–liquid interface for 28 days. Cells are treated with 20 ng/ml IL-13, 2 ng/ml IL-13, 20 ng/ml IL-9 and 20 ng/ml IL-9 and 20 ng/ml IL-13. Transepithelial resistance (TER), number of ciliated (anti α1-acetylated tubulin antibody) and goblet cells (Muc5AC+) are assessed as a measure of tissue differentiation. Results: Both asthmatic (n = 4) and normal (n = 5) cell cultures formed well-differentiated pseudostratified epithelium (TER >500 Ω/cm2). Asthmatic cultures expressed significantly more goblet cells (50.6%, SD 15.9) when compared with non-asthmatic cultures (23.6%, SD 6.3) under basal culture conditions (p = 0.036). Significantly more goblet cells are seen in asthmatic cultures when chronically exposed to IL-13 (20 ng/ml and 2 ng/ml), IL-9, IL-9 plus IL-13 when compared with identically treated non-asthmatic cultures (p<0.05). Asthmatic cultures expressed significantly less ciliated cells (15.1%, SD 2.4) when compared with non-asthmatic cultures (24.7%, SD 5.8) under basal culture conditions (p = 0.0381). Chronic treatment with IL-13, IL-9, IL-9 plus IL-13 produced less ciliated cells in asthmatic cultures when compared with non-asthmatic individuals but these results were not statistically significant. Discussion: Asthmatic cells differentiate at basal conditions with a higher proportion of goblet cells and a lower number of ciliated cells when compared with non-asthmatic cultures. Chronic treatment with IL-13, IL-9, IL-9 plus IL-13 increases the number of goblet cells. Funding: Sponsored by the Irish Thoracic Society. Background: Exacerbations of asthma are associated with an increase in airway inflammation. The ability to predict a severe exacerbation could improve management if doses of maintenance treatment were altered appropriately. Aim: To evaluate the ability of non-invasive markers of inflammation (sputum eosinophils and exhaled nitric oxide (FeNO50)) and clinical symptoms to predict an exacerbation requiring a course of oral steroids in children with severe asthma within 2 weeks. Methods: At four routine clinic visits over a one-year period sputum induction was performed and FeNO50 measured in 55 children (7–17 years) with severe asthma. 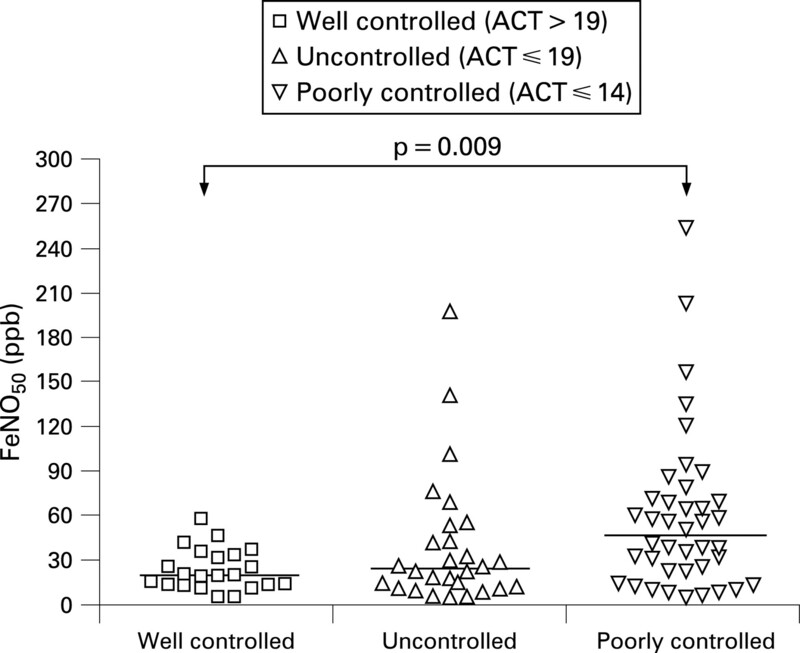 The asthma control test (ACT) was used to evaluate current symptom control (total score 25, lower scores reflect worse control). Results: 203 study visits were completed. 14 children had a total of 19 exacerbations requiring a course of oral steroids within 2 weeks of the clinic assessment. The sensitivity, specificity, positive and negative predictive values for the inflammatory markers and ACT are shown in the table. Conclusion: In children with severe asthma non-invasive markers of inflammation are poor positive predictors of an acute severe exacerbation of asthma, but better negative predictors, because low levels of inflammatory markers (FeNO50 or sputum eosinophil count) or a high ACT score (good symptomatic control) indicate that an acute exacerbation of asthma within the next 2 weeks is unlikely. Introduction: It has been suggested that management of patients with asthma can be improved by using two non-invasive markers of inflammation, sputum eosinophils and exhaled nitric oxide (FeNO50) and that these two measures are positively related. Methods: Sputum induction was performed and FeNO50 measured at four routine clinic visits over a one-year period in 55 children with severe asthma (taking ⩾500 μg fluticasone or equivalent per day) and at two routine clinic visits over a 6-month period in 35 children with mild–moderate asthma (taking <500 μg fluticasone or equivalent per day). Sputum differential cell counts were expressed as a percentage of 400 cells. The relationship between sputum eosinophils and FeNO50 was defined as outlined in the table. Results: 200 paired sputum and FeNO50 samples were obtained in 79 subjects. 37 subjects (47%) were found to have a discordant relationship on at least one occasion (59 paired samples). In 26 paired samples the FeNO50 was high despite low numbers of eosinophils (Eos−FeNO+), in keeping with previous findings; however, in 33 paired samples, despite high sputum eosinophils, the FeNO50 was found to be low (Eos+FeNO−). The relationship was not consistent; 21 discordant subjects also demonstrated a concordant relationship and two showed discordance in both directions. There were no significant differences in the proportions of discordant samples between severe and mild–moderate asthmatic patients (see fig). 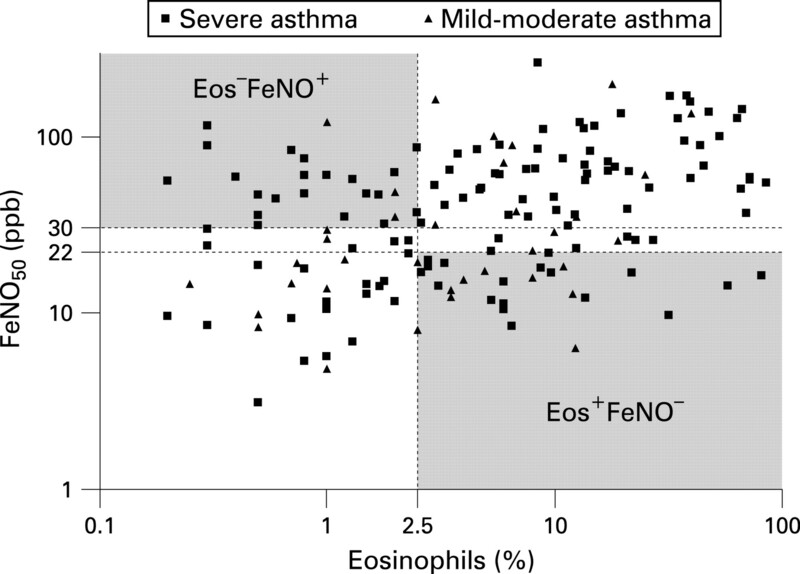 Conclusion: Many children with asthma do not show the expected relationship between sputum eosinophils and FeNO50. The FeNO50 measurement may under or overestimate sputum eosinophilia and is inconsistent over time. The clinical usefulness of FeNO50 to measure underlying eosinophilic inflammation is low and the two measurements cannot be used interchangeably in paediatric asthma. S74 PEPSIN MEASURED IN INDUCED SPUTUM: A TEST FOR PULMONARY ASPIRATION? Background: Pepsin is only produced in gastric mucosa. Pepsin measured in bronchoalveolar lavage fluid is a useful marker of pulmonary aspiration secondary to gastro-oesophageal reflux (GOR) but obtaining samples is invasive. Induced sputum is a potential non-invasive method of obtaining samples. It is possible that the induced sputum procedure could cause GOR and invalidate the interpretation of results. Aim: We assessed pepsin concentrations in induced sputum (N = 20) and in pre and post-induced sputum saliva (N = 19) samples from 20 normal children. Our hypothesis was that induced sputum and saliva after the induced sputum procedure contains no detectable pepsin. Methods: Children, aged 4–16 years, with no respiratory or gastrointestinal disorders were recruited. Induced sputum samples were obtained after nebulisation with 3% saline. Samples of saliva were collected pre and 15 minutes post-sputum induction. Pepsin concentrations were measured using an “in house” ELISA with antiporcine pepsin antibodies. Samples were classified as detectable if pepsin concentration was above our lower level of detection (1.19 ng/ml). Results: Of 20 induced sputum samples 17 (85%) were pepsin positive. Saliva pepsin pre-induced sputum was detected in 17 cases and from a further two cases post-induction. In addition, we observed a statistically significant increase in saliva pepsin concentration after the induced sputum procedure (median increase 2.9 ng/ml, p = 0.004). Conclusion: Pepsin appears to be detectable in the saliva and induced sputum in asymptomatic children and is therefore not useful as a method of detecting GOR-related aspiration. We have shown some evidence that the induced sputum procedure could cause GOR. The frequent finding of pepsin to be detectable in baseline saliva suggests that mild asymptomatic GOR events occur and that pepsin clearance from saliva may not be rapid. Funding: This work was funded by The Royal Belfast Hospital for Sick Children and Northern Ireland Chest, Heart and Stroke Association. Thorax 2008; 64 91-91 Published Online First: 22 Dec 2008.